His doctor then said the president was in “excellent health” but would do well to drop 10 to 15 pounds. 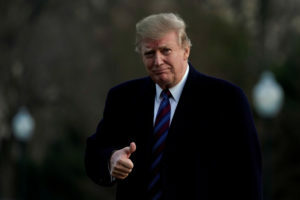 Left: President Donald Trump thumbs up as he returns to the White House in Washington, U.S., after an annual physical test at the Walter Reed National Military Medical Center in Bethesda, Maryland, on February 8, 2019. Photo by Yuri Gripas/Reuters.